A couple of business students at the University of New Brunswick have developed a new app for lawn care customers that allows them to set their own mowing schedules using their smartphones. A couple of business students at the University of New Brunswick have developed a new app for lawn-care customers that allows them to set their own mowing schedules using their smartphones. Josh LeBrun and Brock Slipp will begin testing the app this summer with their new lawn-care company, Finer Edge Lawn Care. They hope their high-tech addition will give them the edge on the competition. LeBrun said the idea came when he was mowing lawns for another company last summer. 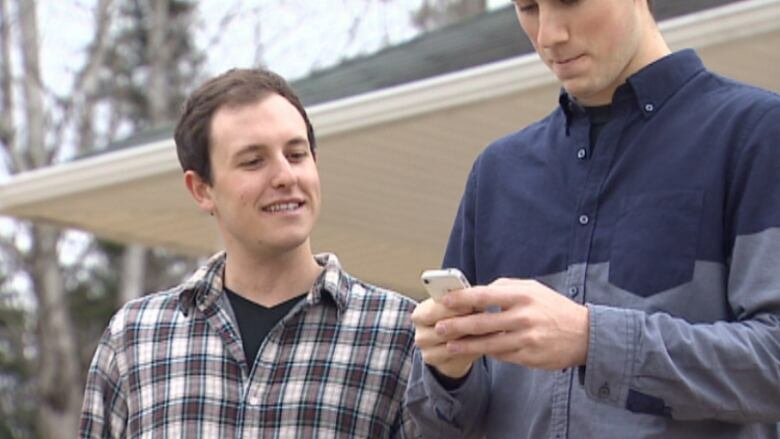 Josh LeBrun and Brock Slipp, two business students at the University of New Brunswick, have developed a new app for lawn-care customers that allows them to pick their own mowing schedules using their smartphones. (CBC)"A couple of times we would get into disputes with customers where they would come out and say, you know, 'My lawn isn't long enough to be mowed, why are you mowing it?' And we would just be doing what we were told," he said. "I found it just really wasn't worth the extra money to be having unsatisfied customers." Once the app is downloaded, customers can customize their schedule, setting a weekly mowing date, ordering short-term service, or even a one-time cut. They can also change or cancel their appointments anytime, said Slipp. "So if they're having a party or something on the weekend, they can say, 'OK, I'd like you guys to come Friday instead of Monday,' and they have the option to do that," he said. The entrepreneurs plan to keep the lawn-care company for at least a few more years, which should help with their student expenses. But down the road, they're hoping to also capitalize on the app. "Potentially it can become a service that we can offer lawn-care service providers, like Finer Edge Lawn Care. So then they can use the app and offer it to their customers," said LeBrun. Finer Edge Lawn Care currently has about 15 customers, but LeBrun and Slipp are hoping to have 50 people signed up before the start of mowing season. As an added incentive, there's also a charity aspect to their business. For every customer they sign up, they will be sponsoring a child in India to go to school.